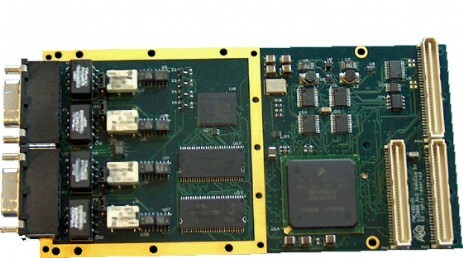 An intelligent quad channel CAN controller PMC, suitable for the standard CAN2.0B, but also for the CAN aerospace, ARINC-825 protocol. CAN is a widely used fieldbus, in automotive, industry and other types of applications. In the last years CAN is more and more used in aerospace applications too. Starting with CANaerospace, nowadays with the new ARINC-825 specification, CAN also contains the specification to be a subsystem bus for ARINC 664 Part 7 networked IMA (Integrated Modular Avionics) architectures. This standard is (will be) used by large aircraft builders like Airbus and Boeing. - CAN aerospace ARINC-825 protocol.